Family members support each other in a variety of ways, and that support can flow in different directions. In some families, older generations may provide more support to younger generations, while in others the support may go in the opposite direction. And in different stages of life the dynamic may change, as resources shift and new needs emerge. The survey asked about four specific types of intergenerational support: adult children providing financial assistance to a 65-plus parent in need; parents providing financial assistance to an adult child; grandparents helping with child care for grandchildren; and parents saving money to hand down to their children after they die. Americans, Italians and Germans are all more likely to say that financial support to a parent or adult child is a responsibility than they are to say the same about child care for grandchildren or parents leaving behind an inheritance for the next generation. 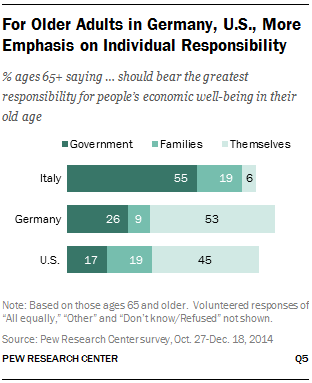 Yet, when asked who should bear the greatest responsibility for people’s financial well-being in their old age, relatively few in Italy and Germany say families should take the lead role. Far more say this should be primarily the government’s responsibility, likely reflecting, at least in part, the reality in these countries, where the largest share of an older person’s income comes from Social Security and other government sources (see Chapter 1). In the U.S., where older generations rely more heavily on earnings, private pensions and other non-public sources of income, most say families or individuals themselves, rather than the government, should be responsible for providing financial security to older adults. Who Should Provide for Older Adults? Fully 58% of Italians and 48% of Germans say the government should have the greatest responsibility in providing financial support to aging adults. Only 24% of Americans say the same. For their part, Americans (30%) are more likely than Italians (20%) or Germans (9%) to say families should bear the greatest responsibility for the financial well-being of their older family members. Similar shares of Americans (31%) and Germans (28%) say that older adults should be primarily responsible for their own economic well-being. Only 4% of Italians agree with this. What do older adults themselves say about this? In the U.S. and in Germany, pluralities of adults ages 65 and older say individuals should bear the greatest responsibility for their own economic well-being in their old age (45% and 53%, respectively). 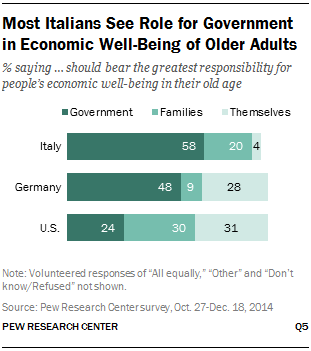 Only 6% of Italians in this age group point to individuals, while 55% say the government should be primarily responsible for the economic well-being of older adults. In the U.S., views on this issue differ by age, with each succeeding age group placing less emphasis on families providing for their aging relatives and more emphasis on individuals being responsible for their own economic well-being. Among those ages 18 to 29, fully four-in-ten say families should bear the greatest responsibility for the economic well-being of older adults. Only 21% of young adults in the U.S. say older citizens themselves should have the primary responsibility, and 26% point to the government. The views of older adults in the U.S. are in sharp contrast to their younger counterparts: Only 19% of Americans ages 65 and older say families should be primarily responsible for providing economic security for their aging relatives. About one-third (32%) of those ages 30 to 49 and 26% of those ages 50 to 64 say families should bear the greatest responsibility. U.S. views about who should provide for older Americans also vary by party identification, likely reflecting broader views about the role of government. Republicans are divided over whether families (33%) or individuals themselves (39%) should bear the greatest responsibility in providing economic security for older adults. Only 13% of Republicans say the government should be primarily responsible for this. By contrast, three-in-ten Democrats say government should be mainly responsible for insuring the economic well-being of older adults. Some 25% of Democrats say families should bear the greatest responsibility, and 29% say the burden should fall to individuals themselves. Independents are about evenly divided: 31% say families should bear the greatest responsibility for people’s economic well-being as they age, 30% say individuals themselves, and 24% say the government. Though the three nations differ in their views of who should bear the primary responsibility for the economic well-being of older residents, majorities in each nation say that adult children bear at least some responsibility for helping aging parents financially in cases of need. Italians are the most likely to say that an adult child has a responsibility to provide financial assistance to an aging parent in need; 87% say so, while 13% say this is not a responsibility, regardless of whether it might be a good thing to do. A broad majority of Americans (76%) view this as a responsibility, as do 58% of Germans. Among Italians, equally large majorities of young, middle-aged and older adults agree that providing for an aging parent in need is a responsibility. In both the U.S. and Germany, young adults are more likely than older adults to view this as a responsibility. For example, fully 86% of Americans ages 18 to 29 say adult children have a responsibility to provide financial support for an aging parent in need. By contrast only 64% of adults 65 and older say the same. The pattern of responses is similar among German adults. There is very little difference between the views of adults who have aging parents and those who do not, when it comes to their outlook on providing financial support to an aging parent in need.10 In both the U.S. and in Italy, roughly equal shares of those with and without parents ages 65 and older say this is an adult child’s responsibility (74% and 76%, respectively, in the U.S. and 85% and 88% in Italy) . In Germany, there is somewhat of a gap: 52% of those who have a parent age 65 or older who needs financial assistance say providing such assistance is a responsibility, while 61% of those who do not have a parent in that age group say the same. Of the three publics surveyed, Italians are also the most likely to say that financial support, when needed, should flow from parents to their adult children. Nearly three-quarters of Italians (73%) say parents have a responsibility to provide financial assistance to their adult children. Among Germans, 63% regard this as a responsibility, and among Americans half do. Opinions on this are fairly consistent across age groups in Germany. In Italy, older adults are more likely than middle-aged and younger adults to view this as a responsibility; 85% of Italians ages 65 and older say providing financial support to adult children in need is a responsibility, compared with 58% of 18- to 29-year-olds, 70% of those ages 30 to 49 and 73% of those ages 50 to 64. Among Americans, more 18- to 29-year-olds (57%) than those ages 30 to 49 or 50 to 64 (46% and 48%, respectively) say helping adult children in need is a responsibility; those ages 65 and older fall somewhere in the middle (54%). Across all three countries, men and women have similar views about whether a parent has a responsibility to provide financial assistance to an adult child who needs it. Men and women also express similar opinions about providing financial assistance to aging parents. In the U.S. and in Germany, opinion is fairly consistent regardless of whether respondents themselves have an adult child. In Italy, adults who have grown children are more likely than those who do not have grown children to say parents have a responsibility to provide financial assistance to an adult child who needs it (78% vs. 67%). Across the U.S., Italy and Germany, caregiving for grandchildren is seen as less of a responsibility than financial support for parents or adult children. 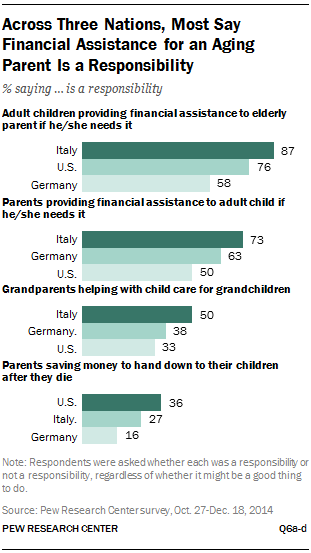 Adults in Italy and Germany are more likely than those in the U.S. to say grandparents have a responsibility to help with child care for their grandchildren: 50% of Italians, 38% of Germans and 33% of Americans say this is a responsibility. In both Italy and Germany, older adults are much more likely than their younger counterparts to say that caring for grandchildren is a responsibility. Not surprisingly, grandparents have a slightly different take on this, especially in Italy and Germany. In the U.S., four-in-ten grandparents say that carrying for a grandchild is a responsibility. Only 29% of U.S. adults without grandchildren say the same. The gaps are even wider in Italy and Germany. Fully 68% of Italian grandparents say caring for a grandchild is a responsibility, compared with 44% of adults who don’t have grandchildren. And in Germany, 54% of grandparents (compared with 31% of adults who don’t have grandchildren) view this as a responsibility. Views about whether parents should save money to hand down to their children after they die differ substantially across countries. Americans (36%) are twice as likely as Germans (16%) to view this as a responsibility. Even so, a solid majority of Americans (62%) say this is not a responsibility. Among Italians, 27% say parents have a responsibility to leave behind money for their children, while 70% say they do not. In the U.S., young adults are much more likely than middle-aged or older adults to view leaving an inheritance as a parent’s responsibility. Fully 51% of Americans ages 18 to 29 say this is a responsibility, compared with 36% of those ages 30 to 49 and roughly three-in-ten (28%) of those ages 50 and older. While most Americans do not view leaving an inheritance as a responsibility, a previous Pew Research survey found that 77% of adults ages 65 and older plan to leave money or property to their children or other family members when they die. Among adults with living parents ages 65 or older, 43% said they expected their parents to leave them some inheritance. In Italy, views about whether parents have a responsibility to save money to hand down to their children do not differ substantially by age. Similarly small shares of younger and older adults say they see this as a responsibility, while substantial majorities across age groups say this is not a responsibility, even if it might be a good thing to do.